Dramatic scenes unfolded as hundreds of congregants of the Enlightened Christian Gathering church protested in front of the Commercial Crime Court in Pretoria, South Africa before the man they call father and Major 1 had to appear on fraud and money laundering charges. 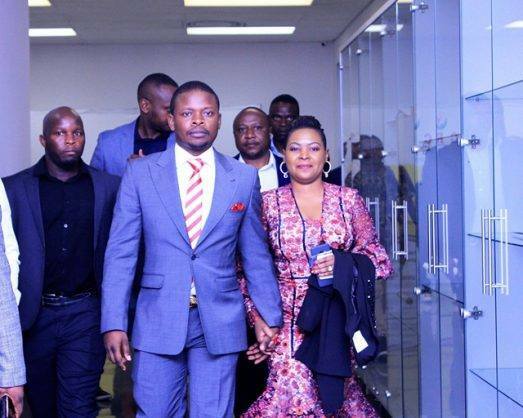 South African media houses reported that Prophet Shepherd Bushiri and his wife made a very short court appearance in the Pretoria Commercial Crimes Court on Monday after sending the past weekend in police custody. The presiding judge postponed the matter to allow the State to carry out further investigations. 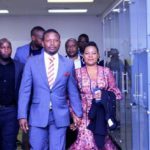 Bushiri and his wife were remanded in custody but they are scheduled to return to the court on Wednesday. The couple was arrested by the special investigations unit, The Hawks, at a luxury hotel in Rustenburg on charges of fraud and money laundering on Friday morning. The South African media reported on Friday that the Hawks spokesperson, Hangwani Mulaudzi, said the case against the couple was linked to alleged offences of fraud and money laundering, as well as the contravention of the Prevention of Organised Crime Act (POCA), which had been under investigation by the specialised unit since 2015. Added to the charges is the contravention of the South African Exchange Control Regulations relating to foreign currency to the amount of U$1 147 200 or about R15 million. In April last year, tabloid publication Sunday World reported that Bushiri was apparently making so much money from his churches in SA that he was able to send batches of cash in amounts of up to R15 million a month back to his home in Malawi. He used his private jet to transport the large amounts of undeclared cash to his homeland. At the time Major 1 is on record of telling reporters from the South African national broadcaster, SABC News, that he was not even aware that the police were investigating him and that he had only heard about the investigation through the media. Rival prophet Pastor Paseka “Mboro” Motsoeneng arrived at the court in Pretoria to observe the proceedings. Mboro said the Bushiri family had urged all supporters to attend a church meeting on Monday evening. Mboro and Bushiri only recently put their differences aside. The two charismatic church heavyweights, who had been publicly crucifying each other and often skewered each other in their sermons over five years, made up last year. Bushiri pledged Mboro R1million as a gift for his birthday, which Mboro said was destined for charity. Pictured: Hundreds of supporters of Prophet Shepherd Bushiri protested outside the Commercial Crimes Court in Pretoria while their ‘father’ appeared on fraud and money laundering charges.